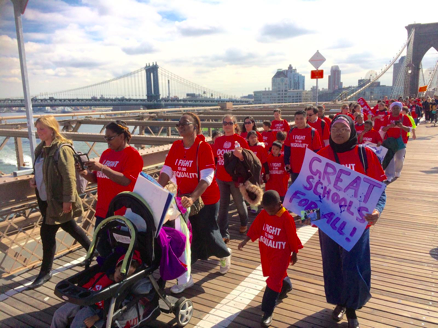 NEW YORK, NY — Holding signs charging “Separate and Unequal, Still” and “Great Schools Now,” 18,500 parents, students, and educators rallied in Brooklyn’s Cadman Plaza on Wednesday, demanding an end to education inequality that traps 478,000 New York City children—90% of whom are black and Hispanic—in a separate and unequal system of failed schools. After the rally, hundreds continued on to march across the Brooklyn Bridge to join Bronx Borough President Ruben Diaz Jr. at a press conference on the steps of City Hall. Grammy, Oscar and Golden Globe Award Winner Jennifer Hudson, international DJ and producer DJ Jazzy Jeff, and Grammy-Nominated Aloe Blacc performed for parents at the rally, amplifying the call for bold action for every child in New York City to receive equal access to excellent education. 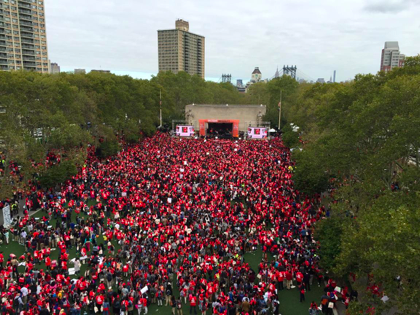 Speakers to the crowd of 18,500 assailed the “Tale of Two School Systems” that foreclosed opportunity for children trapped in failed schools. According to a recent study on educational mobility by Families for Excellent Schools, A Tale of Two Schools, students attend one of two distinct sets of schools that are walled off from each other. The 116,000 students attending the city’s top 141 schools are essentially guaranteed academic success because their elementary schools commonly feed into the city’s best middle and high schools. But in a separate, unequal, and effectively segregated set of 850 schools, 478,000 students (90% of color, 89% living in poverty) are consistently trapped in low-performing schools, with only a fraction able to escape and attend a quality school. The number of students locked in this inferior school system is bigger than the entire school districts of Dallas, Washington DC, and Boston combined. “How can we be against this? How can we deny the families and the children this possibility? 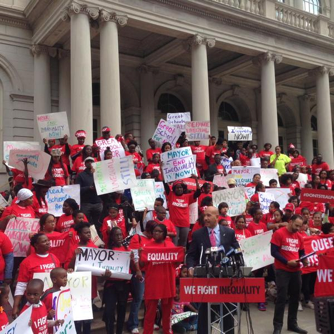 This equality?” asked Bronx Borough President Ruben Diaz Jr. While hundreds of district schools have failed black and Hispanic students in New York City, charter schools have proven to be effective in bridging the city’s racial achievement gap. Black and Hispanic students in the city’s charter schools performed nearly twice as well on math (42.8% proficient) than in district schools (22% proficient) and nearly 50% better on English Language Arts (28.1% proficient in charter schools; 19.5% proficient in district schools). Yet the de Blasio administration has shown a determination to block the growth of charter schools, consistently throwing up bureaucratic roadblocks as a means of refusing to grant charter schools space in public buildings. “It’s time for the Mayor to stop opposing charter schools, and give families access to the schools they want. It’s time for the Mayor to live up to the promises he made to New York families. It’s time to end this Tale of Two School Systems!” said Zarida Teel. Quality middle schools are common destinations for students in low-performing elementary schools only 1.6% of the time. · Quality high schools are common destinations for students in low-performing middle schools only 3.3% of the time. · In these 141 tightly linked schools, at least 60% of students meet academic standards. Of the 116,000 students in this system, only 29% are children of color (compared to 78% for all other public schools). · In these 850 interconnected schools, no more than 30% of students meet academic standards. Of the 478,000 students in this system, 90% are black or Hispanic. · There are 293 NYC schools where more than 90% of students failed to read or do math at grade level on this year’s statewide assessments; Mayor de Blasio’s effort encompasses only 94 schools. · More than half of all Renewal Schools showed declines in either ELA or math: proficiency rates at 34 of the 63 elementary and middle renewal schools declined in either ELA or math. Eleven Renewal Schools reported declines on both assessments. On average, Renewal Schools were just 7.1% proficient. · Academic gains for white and Asian students outpaced those for black and Hispanic students in this year’s ELA and math assessments, widening the racial achievement gap. · The top quarter of schools are improving twice as fast the bottom quarter. · The bottom quarter of schools enrolls students who are 96% black and Hispanic.